While traditional roofing materials like tiles and shingles are great for the average, pitched roof; they are a poor fit for residential flat roofing. Flat roofs aren’t very effective at removing standing water, so it tends to puddle and pool on the surface of your home. If you were to use these traditional roofing materials, water would quickly begin to leak into your home. Imagine a waterfall in your living room. Yikes! Instead, residential flat roofing requires special considerations, with John Beal Roofing providing a variety of solutions designed specifically for the kind of standing water these roofs are likely to face. They use different materials than what you would use on a pitched roof but will provide much better protection. Of all the flat roofing options on the market, John Beal Roofing recommends TPO roofing. TPO (Thermoplastic Polyolefin) roofing is a flat roofing solution that has continued to grow in popularity since it was first introduced in the 1990s. It offers exceptional protection without breaking the homeowner’s bank! Made of rubber, ethylene, and propylene; TPO is bonded using a variety of fillers (such as talc or fiberglass). When combined, these materials make TPO one of the strongest solutions available to flat roofs. TPO is also offered in three different widths, thereby reducing the number of seams. The fewer seams, the less of a chance that water could find it’s way into your home. The average lifespan of TPO roofing is 15 to 20 years. Here are a few other options available to homeowners with residential flat roofing. EPDM (Ethylene Propylene Diene Monomer) is a single-ply rubber roofing membrane, installed using an acrylic bonding agent. It is one of the easier flat roofing solutions to install, even for roofs with unusual layouts. Because it is easier to apply, homeowners save time and money during installation. One disadvantage of EPDM is that its rubber surface tends to heat up in the sun, which can have a negative impact on the heating & cooling bill of the homeowner. This should be considered when the homeowner is considering which roof might be best for them. PVC (Polyvinyl Chloride) is another great solution for those with residential flat roofing. While more expensive than EPDM, PVC roofing is also more durable. This roofing solution is known to be able to withstand up to 300 pounds per inch, exceeding the industry standard of 200 pounds per inch by 50%. The strength of this material adds to it’s lifespan. 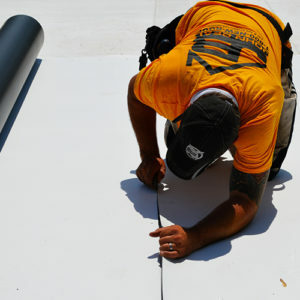 While other flat roofing lasts 15 to 20 years, PVC can last as long as 30 years! An incredible amount of time, given the damage inflicted on many flat roofs. Another benefit of PVC roofing is that it is more energy efficient. PVC is offered in the color white, which can reflect the up to 78% of the sun’s rays away from your home, rather than absorbing it like EPDM. Built-Up Roofing (BUR) is an older method of flat roofing but remains effective. BUR is often called “tar and gravel roofing” because of the materials used to make it. Because BUR is extremely heavy, it is uncommonly used for residential flat roofing, reserved for commercial properties that can bear the weight. Modified Bitumen is comparable to BUR, only two other substances are added: rubber and elastomers. Installing modified bitumen can also be a difficult and expensive process, which makes it more applicable to commercial use. Silicon Spray is a spray, applied to the surface of your flat roof. It offers better leak protection and is easier to install than installing rubber or tar. The materials used in this spray can be quite costly, though, which many homeowners are not willing to pay – no matter how well it protects their roof.